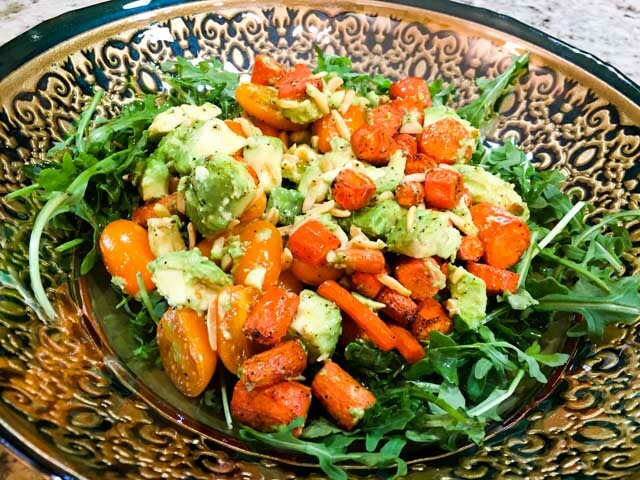 Have you tried roasted carrots and avocados together? I don’t think I ever thought of mixing carrots with avocados, but the other day a simple email with notification of a new post by Kelly arrived, and I dropped everything I was doing to check it out. She shared the recipe for a gorgeous quinoa concoction found in “The Clever Cookbook.” Cute name, almost as cute as the blog hosted by the author, Emilie: The Clever Carrot. I can see you’re smiling now, it’s impossible not to smile at the name. I need another cookbook as I need a third eye, but my will power for certain temptations is non-existent. I don’t even try to put up a fight anymore, just go to amazon and get the job done. Ordering the Kindle version minimizes the amount of guilt, in case you are wondering how I deal with my weaknesses. That night I laid in bed for a long time reading the book, and could not wait to make this salad, because who could resist getting acquainted with a smashing pair? Less than 24 hours later the salad was part of our dinner, and it was a tremendous success! I urge you to try it too. I modified the recipe a bit, but you can find Emilie’s original in her book, which by the way is a total delight! You need to have it, so don’t even bother resisting. Heat your oven to 425 ° F. Line a rimmed baking sheet with parchment paper. Place the carrots in a large bowl. Add the olive oil and sprinkle with Southwest spice, and a little salt. Toss well to coat. Spread the carrots out on your sheet pan. Roast for about 20 minutes, or until the carrots are caramelized and tender. In the final 5 minutes, add the slivered almonds on top. Remove from the oven, add the tomatoes. Give it a good stir. Allow the mixture to cool slightly while you dice the avocado and drizzle the pieces with lemon juice to prevent browning. Add the avocados to the carrots, and toss gently to combine. Place the mixture on top of arugula leaves on a serving bowl, drizzle olive oil and some more lemon juice, adjust seasoning with salt. Toss very gently and serve at room temperature. Comments: Talk about a delicious dinner! It’s not everyday that a salad draws enthusiastic compliments from my beloved husband. 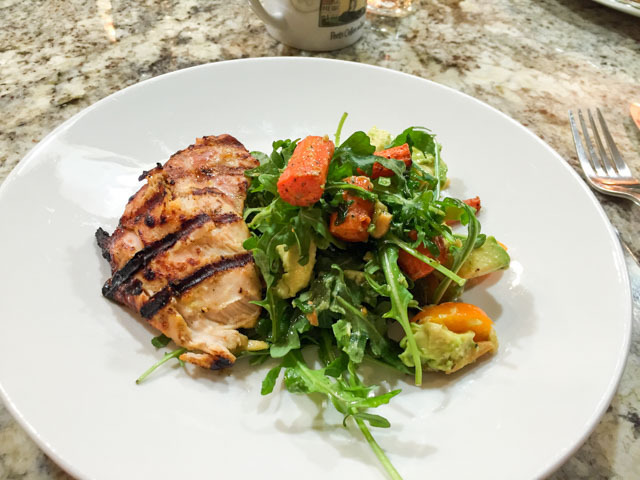 We both went crazy for this one, and Phil in particular thought that the grilled chicken was a perfect match, making the meal worthy of a fancy French style bistrot. On a slight tangent: the chicken was super simple. I marinated boneless, skinless chicken thighs early in the morning in a mixture of yogurt, a touch of olive oil, lemon juice, paprika and turmeric. A smidgen of agave nectar just because. When it was time for dinner, I scraped the marinade off, seasoned the meat with salt and pepper, and grilled until done. 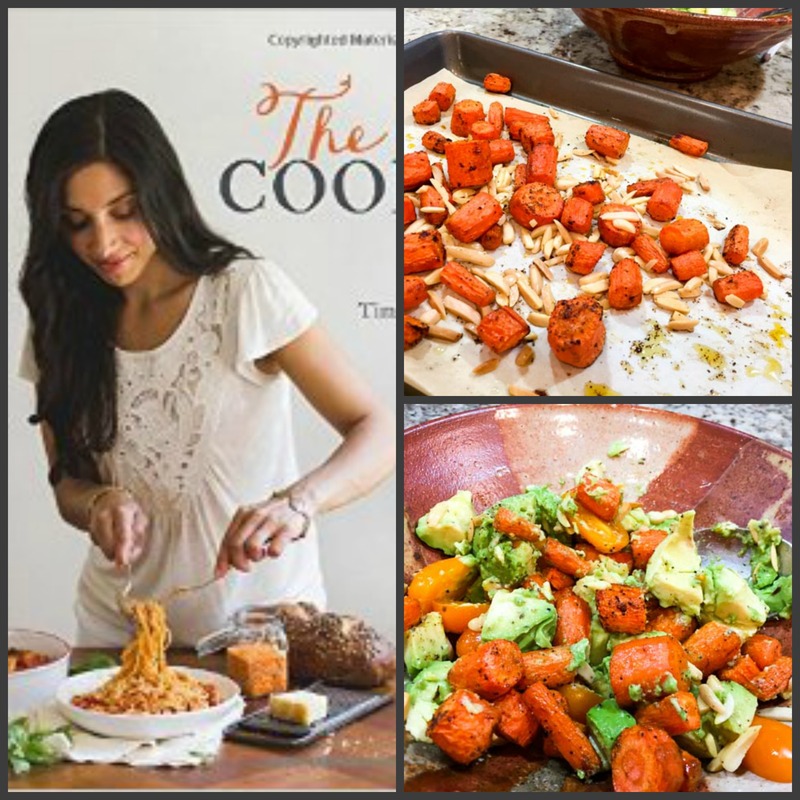 The combination of sweet roasted carrots, the hint of spice, and the creaminess of the avocado was irresistible! The salad has enough substance to stand proud on a fully vegetarian menu. Maybe paired with a hearty pasta dish, or next to crostini with mushrooms and cheese? Or you can skip the greens and use the smashing mixture over grains such as farro or quinoa. Your call. THREE YEARS AGO: Spring has Sprung! Have never had the nous to put these two together either, but now cannot wait to try. A lot of colour and body and unexperienced taste there . . . have to find out what goes into South-west seasoning for obvious reasons, but that too can be managed 🙂 ! Also do like your chicken marinade: have not used paprika and turmeric together as a rule . . . Oh: ‘The Clever Carrot’ – must remember to visit my mailbox ere I go and click on a certain subscription methinks . . .
Emilie used Mexican spices – I love the Southwest blend from Penzey’s and here are the ingredients for you; Warm chili peppers with onion, garlic, pepper and cilantro, with a smoky hint of chipotle. the second time I made this salad (yes, it is that good!) I added only paprika and was excellent too – I think all you want is to add something to play with the sweetness of the carrots. Thanks Sally – I guess I would have made a similar mix but may not have thought of the chipotle which is available but not much used here in Australia . . . the salad is on the menu around Easter . . .
Looks delicious and I must try it the next time I get avocados. I have plucked two favorite recipes for our corned beef tonight I guess it will be a last minute decision between Sean Brock’s carrots braised in carrot juice and garlic roasted carrots. I am inclined to do the roasted with slightly cook and prep time. Yes, smashing is a funny word really isn’t it when you think about it? How did it become synonymous with being something fab? And you do it brilliantly! Your English is so good 😀😀😀 100% better than my Brazilian!! What a delicious meal you’ve put together here Sally – I agree, French Bistro style; I would love to be enjoying it en plein air with you. 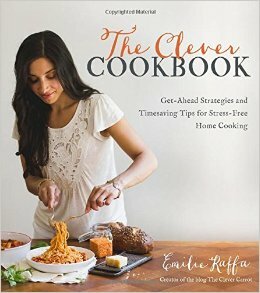 You are so kind and generous to not only feature Emilie’s salad but also put together a review of her new cookbook. I’m so glad you’re enjoying your latest discovery and this roasted carrot and avocado combination sounds like an utter winner; I must try it myself. Wishing you a fun and relaxing weekend – we are trying to decide between spring skiing and picnicking by the ocean… (speaking of smashing pairs… x). thanks again for the permission to blog on your recipe! What an amazing combination! Thanks for this!